Martin is the Kaibosh Wellington operations manager, but his journey with Kaibosh began as a volunteer in 2013. Martin’s heart for people and attitude to get ‘stuck-in’ has seen him take on many roles beyond his official job title in the last 5 years. A big part of the current Kaibosh team, Martin shares insights into his journey with Kaibosh. How are you involved in Kaibosh? I’m currently the Kaibosh Wellington city operations manager. I began my association with Kaibosh as a weekend market rescue volunteer in 2013 after attending a Quiz Night for Cheats fundraiser. I was volunteering at a Kaibosh stall at the Newtown fair in 2014 and got chatting to one of the board who mentioned Kaibosh were looking for drivers. Within a week I was driving and a paid employee and when Kaibosh opened our Lower Hutt office in 2015 I was asked to become the Wellington operations manager, which I have happily been since! What inspired you to be a part of Kaibosh? When I attended the Quiz night for cheats fund-raiser back in 2013 I was struck by the goodwill and community aspect that the Kaibosh volunteers and staff seemed to have. I was immediately drawn in and wanted to be involved. It was the complete opposite of the for-profit corporate environment I was working in at the time. What’s one of your stand-out Kaibosh memories? A stand out memory for me was the six months after the November 2016 earthquake when Kaibosh was “homeless.” It was a hot summer and myself and my buddy & co-worker at the time, Dee, spent the summer collecting, sorting and distributing food out of the back of the Kaibosh chiller truck or from the space we used at the Wellington City Mission. It was hard work but also a lot of fun, we were outside all day and we’d stop for a swim in the ocean when it got too hot. I’m really proud of the fact that even when Kaibosh had no base we were still able to provide our recipients with the food they have come to rely on. Could you share a little about this photo? This photo is of myself (right) and Lance, who is now our full time Lower Hutt driver but at the time was just volunteering. This was taken at our Myrtle Crescent site which we moved into around March 2017. 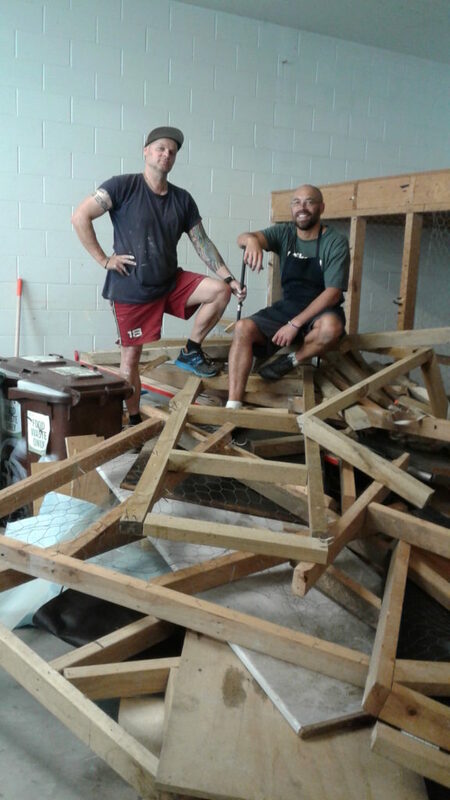 It needed a lot of work including a bit of demo, so Lance and I had spent the morning with sledgehammers and crowbars dismantling the cages in the back ground. It’s a good indicator of what’s expected if you’re going to work for Kaibosh, so much of it is rolling your sleeves up and getting stuck in! Help Kaibosh celebrate 10 years by donating 10 for 10! Learn about the other 10 Faces of Kaibosh!